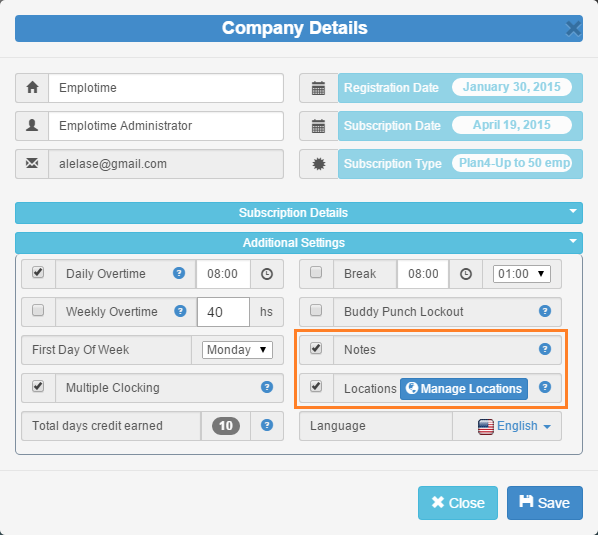 Emplotime allows employees to report extra information like Location and Notes When clocking In or Out. You can select one or both of these options from the "Additional Settings" tab, inside the Company Details area within the Emplotime Administrator Portal. NOTE: Location has evolved to Geolocation feature. The information related to locations in this article is not longer relevant. For more information related to the new geolocation feature, read the new Emplotime Geolocation article. Locations: By selecting this option, the employee will be prompted to choose from the locations list after clocking In, but of course, you will first need to enter some locations. The "Manage Location" button will allow you to add or remove locations easily. 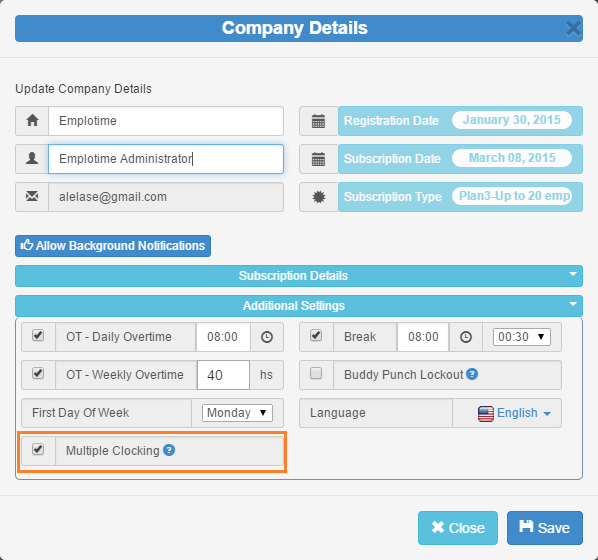 Emplotime allows to activate multiple clocking (or multiple punching) from the Additional Settings inside the Company Settings. This feature, provides the ability to monitor breaks by allowing your employees to Clock In and Out several times a day. Emplotime Version 2.0, brought the time and attendance solution to a whole new level, since it now provides also wonderful and detailed reports where you can see, not only, total break times on a daily basis, but also all the employees Ins and Outs transactions, that, together with the total regular and overtime hours, it becomes to a comprehensive source of attendance information for the employer. Without selecting the multiple clocking option, the time clock page will be restricted to one single In and One single Out per employee per day. So, remember to activate Multiple Clocking if you would like your employees to "punch" every time they take breaks or lunch.